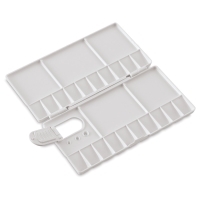 The Masters International Folding Watercolor Palette makes taking your painting supplies with you a snap. 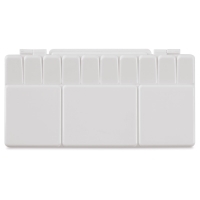 Close up this economical palette for easy travel and storage. 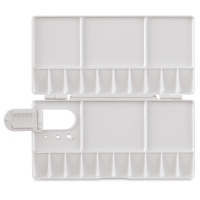 Constructed from lightweight, durable plastic, the white palette features 20 small color wells, five large mixing areas, three holes for holding brushes, and a thumbhole. It measures 8" × 8" when open and 8" × 4" when closed.